With the upcoming Sesquicentennial (150 years) of the Civil War, a lot of discussion is occurring around racism in America, as well as the role of religion and politics in the making and unmaking of slavery and racism in America. Here’s two really good resources, both podcasts. 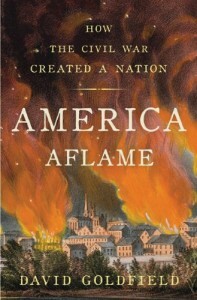 First, in Evangelical Fervor and the Crisis of the Civil War: A Conversation with Historian David Goldfield, Albert Mohler interviews historian and award winning author David Goldfield on his new book America Aflame: How the Civil War Created a Nation. The differences between the Evangelical emphases of northern and southern Evangelical theologies – northerners had a theology that included improving civic society, while southerners did not. The Second Great Awakening and the Civil War. The two great sins as per northern Evangelicalism – the increasing power of the Roman Catholic Church, and the great sin of slavery. The anti-Catholic Know-Nothing Party, which merged with the abolitionist Republican Party, which united these ‘twin despotisms’ into one party and helped elect Abraham Lincoln. The dramatic politicization of these moral issues due to Evangelical involvement in politics, hastening the Civil War. 1787 – The Constitution: Jefferson was not in the country during the writing of the Constitution, but in order to keep the Union, American legislators included such heinous language as the 3/5ths compromise, thereby continuing the racist slavery policies. 1787 – Northwest Ordinance: In this legislation, based on the 1784 bill which failed, Jefferson’s ideas succeeded in forcing all northern states being admitted to the union to be non-slave states, but this set up the divide between north and south. However, this still could have prevented a civil war if more free states, which were generally more prosperous, were to join than slave states. This could have marginalized the slave states. 1800 – Suggesting that Negroes born after 1800 were Free: Jefferson actually suggested this, but his idea, meant to phase out slavery in America, was rejected by legislators. 1820 – The Missouri Compromise: This pretty much sealed the Civil War into place, ensuring that for every free state added, a slave-state would be added. Both the Thinking in Public podcast (RSS) and The Thomas Jefferson Hour (RSS) podcast should be in the queue of every thinking person, certainly in the queue of every thinking Christian.